A heart-warming story or our feathered friends in Antarctica! This warm-hearted tale takes us to the antarctic in the early spring. We are introduced to the native birds, whales and several other species fournd in this cold climate. We meet SCAMPER as he hatches from his egg to emerge with wonder and curiousity at the world around him. SCAMPER befriends SNOWFLAKE and together they begin to explore and play. 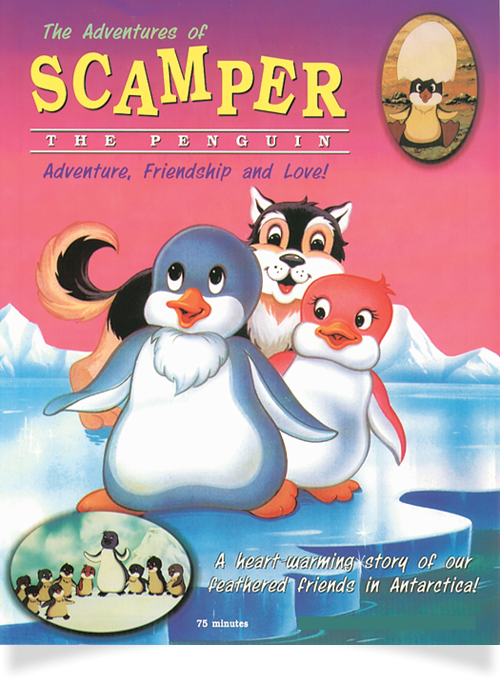 Along with their friend LOUIE, SCAMPER and SNOWFLAKE meet a human being working in the antarctic as a scientist. The scientist is very kind and our penguin friends invite COWBOY, the scientist's dog, to join in their games. SCAMPER, SNOWFLAKE and LOUIE come to believe that humans are friendly and safe. They are caught off guard by trappers and held aboard their ship as prisoners. SCAMPER leads a triumphant escape with the help of his loyal friend COWBOY the dog. Once safely back with the colony of penguins. SCAMPER realizes the importance and value of listening to his parents and trusting in their wisdom. In spite of his adventurous spirit, SCAMPER'S courage and bravery has won great respect throughout the colony. SNOWFLAKE has fallen in love with SCAMPER and happily agrees to be his bride. As winter approaches, SCAMPER leads his penguin colony to a warm, familiar place where they can rest safely as the cold season draws near. Produced By: Lifework Corp., Inc.